Golf comparisons – Mk2 vs Mk6 – HubNut – celebrating the average! 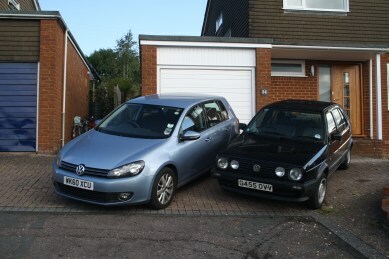 Visiting my sister gave me a chance to compare my Mk2 Golf with her Mk6. Sadly, due to insurance limitations, this comparison was on a strictly cosmetic basis, but it was interesting nonetheless. The first thing that strikes you, as with any car these days, is how much the Golf has grown. The Mk6 really is a large car, and that’s driven home by impressive rear passenger comfort. There’s loads of space! The Mk2 isn’t too bad in the back, but is nowhere near as luxurious in feel. Aside from the chunky C-pillar though, there’s very, very little to tie the two cars together in styling terms. It shows just how far the Golf has evolved of the years, even if it doesn’t seem that many changes were ever made at each generational transition. Inside, it’s notable that just the indicator switch of the later Golf seems to have more controls than the entire dashboard of the Mk2. It doesn’t feel much different to any other car out there, while the Mk2 definitely feels ‘Volkswageny.’ Of course, there has been some progress. This 2-litre turbo diesel can blow the older Golf into the weeds, and deliver 50mpg compared to 32. It’s a very nice car to travel in as well, though sombre and a bit too dark inside. The Mk2 at least has grey seats and carpets to brighten things up a little, and a sunshine roof. overall though, the only similarity is a massive blind-spot-inducing piece of poor design that was constantly complained about when the Mk2 was current. How sad that it’s the only similar thing is something that arguably should never have been there in the first place.